Indeed, the video is from here at Cheyenne Mountain Zoo! Two staffers, Ashton and Kirsty Strobridge, shot the video during a special robot-themed enrichment night for zoo members in July. In the wild, animals would spend many hours a day trying to find, collect and eat food. They don't have to work quite as hard at Cheyenne Mountain Zoo to earn their living, but they still have a lot of adaptations and energy to exert. That's why we give our animals enrichment daily; enrichment is any activity that engages the animals mentally and physically, and stimulates natural behaviors. During that members-only night in July, all enrichment activities centered around robots. The elephants, mountain lions, gibbons, hippos and grizzly bears all had "destructible" robots placed in their exhibits. 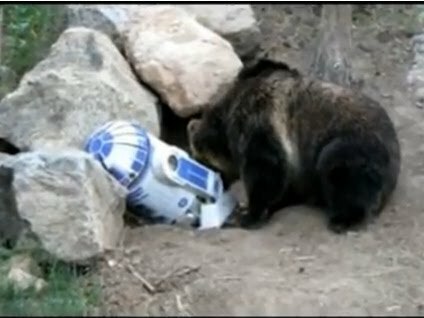 As you saw, Emmett and Digger the grizzlies came face to face with a cardboard R2-D2 stuffed with a few of their favorite snacks (peanut butter, peanuts, fruit and bear chow). Now we just need an Ewok and Jar-Jar Binks enrichment night.